Each Party Pack serves 10 to 12 people. Party Packs require 48 hour notice. 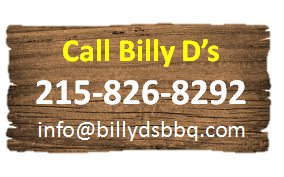 Please call Billy D's at 215-826-8292 or email us at Billydbbq@gmail.com to discuss pricing for your custom barbeque or catering menu. We can craft a delicious menu to fit any budget. All major credit cards are accepted. Assorted Soups, Pepperoni and Cheese, Italian Meats & Cheese Trays, Fresh Vegetables Trays, Stuffed Mushrooms, Assorted Hot Appetizers, etc.